You can reach Dietfurt an der Altmühl only by using train and bus connections. Coming from Regensburg take the Deutsche Bahn RE or Agilis AG train to Kinding Altmühltal train station and change here on to the Bus to Dietfurt a. d. Altmühl, No. 6022. Coming from Regensburg take the B8 to Dietfurt, the ride is approx 45min. If you are coming from the A9, take the exit Kinding and the St2230 will take you straight to Dietfurt an der Altmühl (ca 20min). Dietfurt an der Altmühl is connected with Kinding via bus 6022. Busses are running on a regular basis. Dietfurt an der Altmühl offers a kaleidoscope of beautiful things to discover and way more than you can dream off – this beautiful little town celebrates Asian culture right in the middle of Bavaria. Holidays in Dietfurt, the 7-valley town is active or relaxed, family-friendly or romantic - just as you like! Looking for Asian culture right in the heart of Bavaria? Then you are perfectly right in Dietfurt an der Altmühl. The wonderful town is well known as the Bavarian China. The hilly region is popular as an easy getaway for nature- craving residents and hill-craving tourists. The surroundings of Dietfurt an der Altmühl´s primary appeal lies in the outdoors activities. But while carnival season you should leave your hiking trail and stop in Dietfurt, this lovely town will surprise you in a way you wouldn´t believe, unless you´ve seen it yourself. During carnival the whole town appears like little China, everyone celebrates a big Carnival parade at the „Unsinnigen Donnerstag” (preposterous Thursday) - approximately 50 groups conquer the inner city and bring the chinese culture into Bavaria, mainly with Chinese motto and the Ko-Huoang-di Emperor and his court. The famous Dietfurter Chinese Carnival takes place on the last Thursday in the Carnival season. Starting at 2 o'clock in the morning, the entire population of the city is awakened by the "Maschkaras" with the so-called wake-up call and much noise - Chinese Carnival is today! Subsequently the festive proclamation at the Pagodenpalast (Palace) is done and after a boisterous Carnival celebration prevails until the early hours of the morning in all restaurants of the village! A must see for every visitor. But not only that at the Bavarian China summer the city turns for two days into a Bavarian China celebration mile with music, culture and many delicacies from both countries. The Bavarian China summer is celebrated with super bands, a varied celebration mile with Chinese accessories, game and fun and delicious Bavarian Chinese delicacies. Worth seeing, while in Dietfurt is definitely the City Hall with its distinctive Chinese fountain in front. Culture can be experienced at the Museum in the Hollerhaus Museum, the Alcmona adventure village or the Archaeological Park. In addition, Dietfurt offers plenty of beautiful nature for hiking and cycling along the seven valleys and the Jura heights. There are guided hikes and bike tours with the most diverse requirements. You will find the trail network around Diefurt an der Altmühl, as well as the current hiking schedule on the website of the www.dietfurt.de. The worn cliffs along the river Altmühl offer some appealing terrain for climbers of all skill levels. Stunning views of the valley are awaiting you. The Informationzentrum Altmühltal provides more details on the regions climbing options. With around 3000km of hiking trails and 800km of cycle trails criss-crossing the landscape, foot and pedal are the best way to explore the nature park Altmühltal. All trails are clearly labeled. The most popular route the "Altmühltal Radweg" runs along the river for 166km. Welcome to the Hotel "Die Gams". Our versatile hotel with its cosy restaurant has been family-owned and operated since 1794. This historic-style hotel is located in the heart of Beilngries, surrounded by the scenic countryside of the Altmühltal Nature Park. Der Millipp offers a beautiful, half-timbered façade and free Wi-Fi. 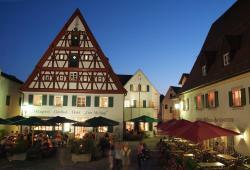 This historic 4-star hotel is in the centre of the Bavarian town of Beilngries. It offers an indoor swimming pool, sauna and regional cuisine. The family-run Hotel Fuchsbräu is a historic brewery dating from 1872.